A series of motorized three-way rotary valves, DN50 (2") to DN80 (3") , with flanged-end connection. 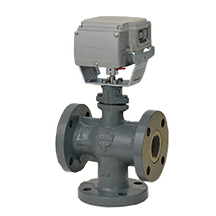 ACTIVAL™ Model VY54_0F is a series of motorized three-way rotary valves, DN50 (2") to DN80 (3") , with flanged-end connection. The valve and actuator are integrated in a single unit. The valve body rating corresponds to JIS 10K. The actuator has a reversible synchronous motor, which operates at a low voltage of 24 V AC. There are following four control signals available.